Printing on both sides of paper is called duplex printing. Most printers offer the option of automatically printing on both sides of a sheet of paper (automatic duplex printing). Other printers provide instructions so that you can manually reinsert pages to print the second side (manual duplex printing). At first, find out from your printer manual or manufacturer if your printer can print on both sides of paper (duplex printing). If your printer doesn't support automatic duplex printing, you have two other options. You can use manual duplex printing, or you can print the odd and even pages separately. Note: When you print with the manual duplex option, you might want to run a test to determine the correct way to reload the pages for the printer you’re using. Check your printer manual or consult your printer manufacturer. In Microsoft Office Word, click the Microsoft Office Button , click Print, click Properties, and then click the tabs in the Document Properties dialog box and review the options. The options in the Document Properties dialog box vary depending on your printer options and configuration. If you see options on any of the tabs for printing on both sides of the paper, duplex printing, or two-sided printing, the printer probably supports automatic duplex printing. If your printer supports duplex printing, follow the directions in the printer manual to create duplex copies. If your printer does not support automatic duplex printing, you can select the Manual duplex check box in the Print dialog box. Microsoft Office Word will print all of the pages that appear on one side of the paper and then prompt you to turn the stack over and feed the pages into the printer again. 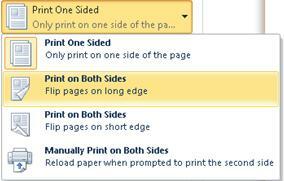 In the lower-left corner of the Print dialog box, in the Print list, select Odd pages. After the odd pages are printed, flip the stack of pages over, and then in the Print list, select Even pages. Note: Depending on the printer model, you might have to rotate and reorder the pages to print the other side of the stack.